This weekend I had the privilege of working with some of the greater San Diego area's best and brightest small business owners. 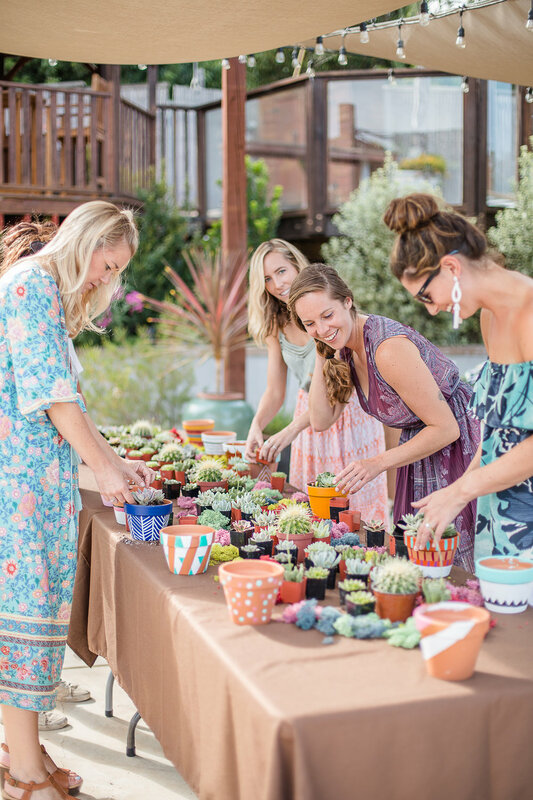 We collaborated on a colorful mexican bridal shower style shoot, and it came out bright and beautiful and I am so proud of everyones contributions. 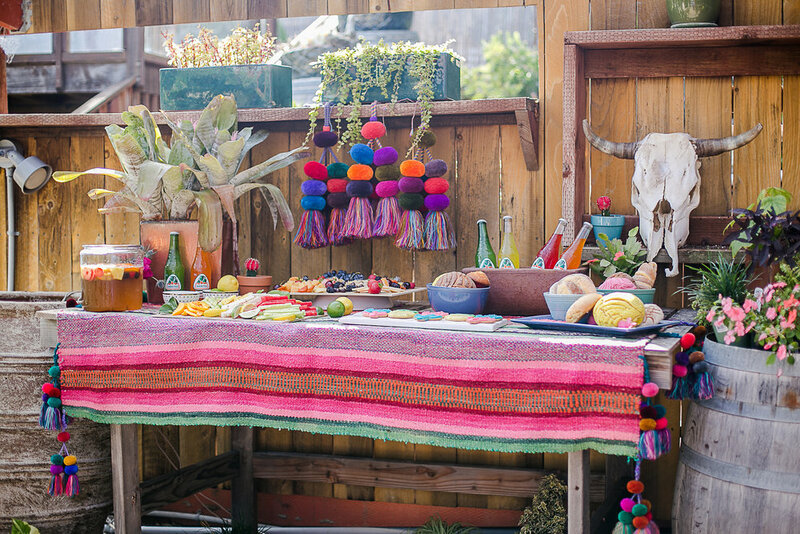 We started with a pretty simple idea, a big bright joyful Mexican bridal shower and incorporated all our own interpretations of that, and came away with this outrageous shoot. What I wanted to do differently about this shoot was that many times you set up this beautiful elaborate set up, but as vendors you don't really get a chance to enjoy that, and this time I wanted everyone to participate and be involved. So we started our set up, directed by the insanely talented Liz at WED (Weddings. Events.Design), who by the way was my wedding planner and one of my favorite people. She completely nailed the style and look of the shoot, as you can see from all these wildly colorful images. And after we completed our set up the party began! Food: Smoke & Brine Co.
We started our shoot day with Zoey from Barrels & Branches conducting an amazing succulent building course. My Husband Eddie and I did a little DIY project, bought terra cotta pots at Barrels and Branches and painted them all with fun cute designs. Barrels and Branches teaches different types of courses multiple times a month, in varying themes. 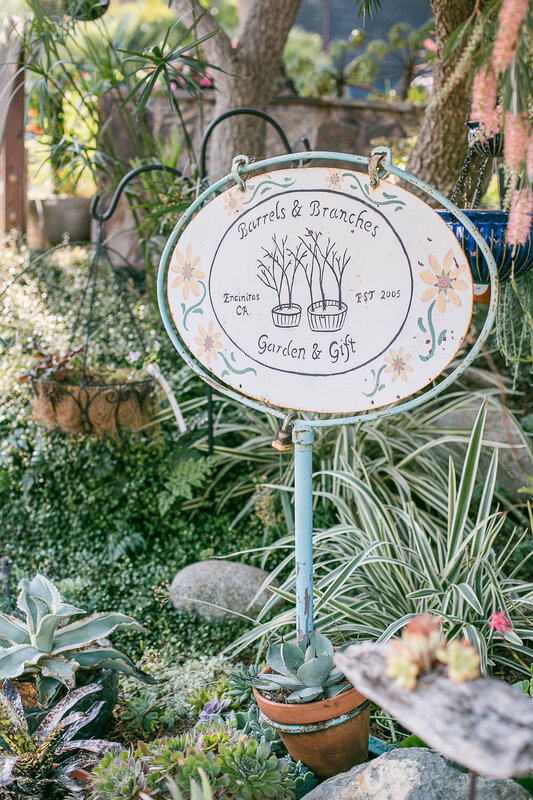 Located in Encinitas this spot is well worth a look, for your next event or activity or even to pick up plants to freshen up your yard. Check out their event calendar HERE. 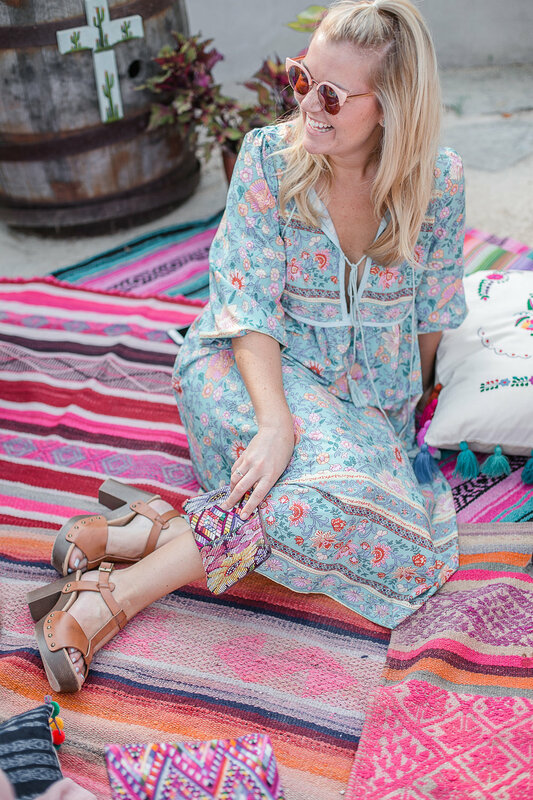 After our activity it was time to unwind by coveting the beautiful hand bags by Folk Project, and indulging with some seriously tasty Drunken Horchata, Vodka and recipe provided by local business Misadventure & co. This delicious traditional Mexican beverage is creamy and sweet, and honestly I think if I made this at home I would blend it. It tastes like a cinnamon vanilla shake, and could be super dangerous. Not only is this vodka delicious, but you're doing Mother Nature a solid. They utilize baked goods that would other wise end up in a landfill. To learn more check out their site HERE. AND they provided a delicious recipe at the end of this blog post. At this point our gorgeous "bride" Mallory arrived, with glamorous hair and makeup by Southwestern Styling. The white lace and soft curls, were a perfect counter point to the bright and energetic colors at the shoot. Mallory, who is not currently a bride, was a pro. She's not a professional model but she totally killed it! After our delicious Drunken Horchata, we moved on to the feast! If you have never checked out the spreads by Smoke & Brine Co., do your self a favor and check out their Instagram to see what you are missing. In particular I loved all the signage Not only are their platters stunning, but fresh and delicious. They also make an unstoppable Sangria, with fresh fruit that will knock your socks off! And the set up collaboration with Folk Project, was in a word breath taking. Merijam, owner of Folk Project is a serious talent. 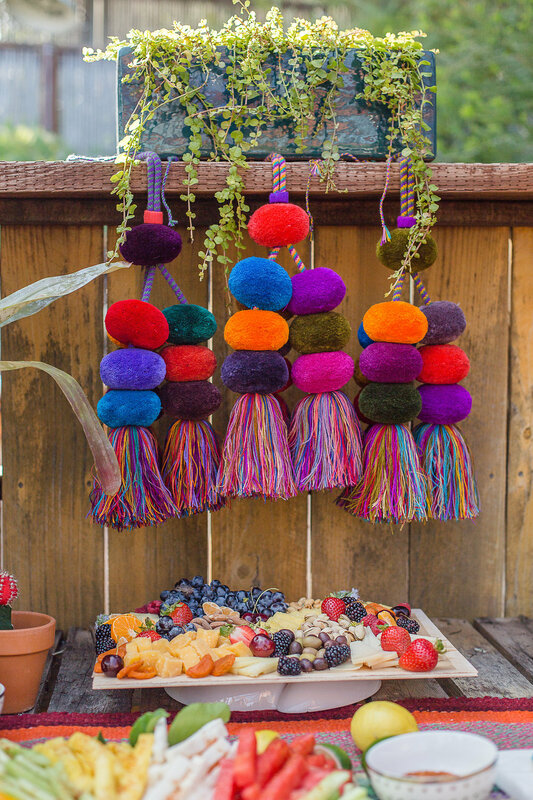 She creates one of a kind pieces, furniture, rugs, blankets, poms and purses. AGAIN do yourself a favor and head over to her Instagram. Your jaw will liter drop. The lush environment of the Venue perfectly accented all the bright colors in the stunning blooms by Moments in Bloom. Moments in Bloom is a north county all star, in fact I had them do the florals for my wedding 4 years ago and I felt so lucky to include them in this shoot. The table scape was created by the talented team at Events by Lift . 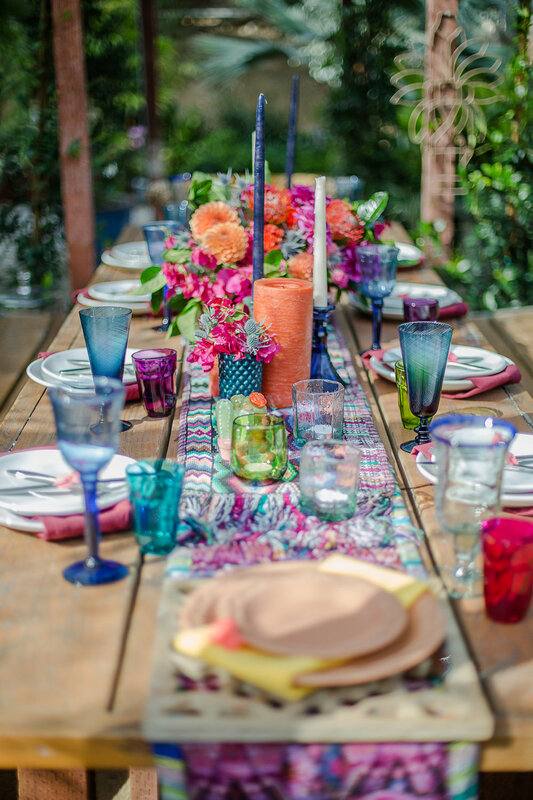 She tied in the bright blues, reds, greens, and whites in all Mexican textiles and reflected that back with the place settings, stemware and platters. Another amazing detail of the day was the delightful invitation suite and signage provided by Epoch Design. It was soft and romantic, but again perfectly exuded the style and culture of our style shoot. I loved all of these details next to the bright and bold treats from VG Donut & Bakery . They are right down the hill from where I live, in Cardiff by the Sea and are a north county staple. Not only do they have donuts that will blow your mind, but the cake and cookies from the shoot were stand out! I (literally) could not stop eating the cookies. In fact I'm eating the last of them as I write this post, and still savoring every bite. They took my instructions for the cake design and went about and beyond. The intricate design was gorgeous and we were all blown away! 1 1/3 cup sugar (adjust depending on how sweet you want - 2/3 cup of sugar if you want it less sweet). Start by soaking the rice, cinnamon, and almonds in a bowl of water all night, or at least for 5 hours so that the rice softens slightly. Strain the water from the cinnamon, rice, and almond mixture that were soaking, disposing of water. Blend the cinnamon, rice, and almond mixture with evaporated milk until a smoother mix is formed and the grains of rice are completely ground. Strain the resulting liquid into a pitcher, and add the sugar, vanilla, and milk. Mix well until everything is well combined. Add a liter of water, and serve with ice. Sprinkle cinnamon on top as garnish in each glass.